Travel to the largest football stadium built in this exciting video slot based on the life of a professional football player, and portrayed in a style that’s represents a realistic portrayal of the experience. Created by NetEnt, Football Champions Cup is presented with 5 reels, with 20 fixed paylines. This game is packed with credible features including overlay wilds, bonus games, free spins, regular wilds and a maximum payout of 1,000,000 coins in the base game. The background portrays the lively atmosphere of a football stadium where all the action is created. The symbols are beautifully designed as to capture the player as he advances further into the game. Each symbol represents different aspects of the sport including a football player, football jersey, football shoes, whistles, gloves and trophies. Poker suits also make an appearance. Football Champions Cup provides a wonderful set of betting options that cater to advanced and beginner enthusiasts. Coin values range from $0.01 to $0.50 per line, making the highest bet of the game $100.00 per single spin with lower wagers also available from $0.20 per spin. Multiple features await enthusiasts in this slot. Four separate wilds are designed into the game including regular wilds, blue, red wilds and overlay wilds. Regular wilds benefit by initiating numerous payouts with only the scatter and bonus symbols not being matched by the wild symbols. The blue and red wilds appear during the free spins. The blue wild appearing on the 1st and 2nd reels and the red wild appears on the 4th and 5th reels. Both the red and blue work in the same manner as regular wilds by matching symbols to help assist in wins. Overlay Wilds, the fourth and final wild culminates all other wilds onto the reels at once. This allows for up to five wilds to be on the reels simultaneously, however those wilds cannot land on top of one another nor may they land on a bonus symbol or scatter, but have substantial value in accumulating wins. 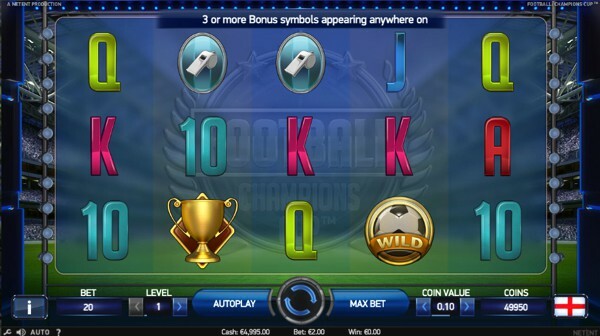 The Free Spins Tournament of Football Champions Cup is extensive, and acts as a bonus game. Enthusiasts choose one of sixteen football teams that are a part of a football tournament. The maximum free rounds that can be earned is four and with each, you will advance closer to the finals. The ultimate goal is to make it to the finals where an extra coin win will be awarded. The bonus game is an interactive penalty shootout. The bonus game plays in a pick and click manner, and consists of five rounds in total and is a multiple part bonus game for each round. The first round will see you selecting one of four positons shown around the goal and attempt to score on the goalie. The second part sees you acting as the goalie and preventing the shooter from scoring. The better you perform, the more you will win. Football Champions Cup provides sensational sound effect, fabulous graphics and bonus features that are creative. The 1,000,000 coin max prize is the driving factor to this game, yet the the bonus games, free spins and four wilds this video slot can provide players with a medium volatility slot. You can benefit greatly from this volatility with its 97.80% payout percentage as it means payouts will occur more frequently but as a lower value. Regardless, this game revolutionizes gameplay in the NetEnt platform and gives users a taste at what it would be like to be a football player. Play Football: Champions Cup below for free in the embedded demo version of the game!